Submitted by bekah on March 21, 2011 - 2:24am. I too have several dictionaries that I never use. I don't know why. Internet's been more than adequate for my word looking up needs, but like this guy said: it feels wrong to throw out a dictionary. Submitted by bekah on March 21, 2011 - 2:25am. Submitted by Kurt Johnson on March 21, 2011 - 2:48am. Just don't forget, those dictionaries may come in use of a group of people decides to build up a library after the destruction (The Book of Eli, styled). Submitted by Jam on March 23, 2011 - 10:50am. Submitted by miasaki666 on March 21, 2011 - 4:42am. Submitted by Humberto Sagárnaga on March 21, 2011 - 4:53am. Submitted by Cassandra on March 21, 2011 - 5:28am. I was spring cleaning yesterday and thought to myself "Self, you better save all these dictionaries in case the zed-heads take over the world and you have to rebuild the entire library of everything." Submitted by greg on March 21, 2011 - 6:48am. Submitted by OneUniverse on March 21, 2011 - 7:02am. The definition online change all the time. The hard-copies are like amber, frozen bits of history, and are pretty to look at. Submitted by Jam on March 23, 2011 - 11:06am. Submitted by zem on March 23, 2011 - 5:42pm. Submitted by Suilean Dubh on August 11, 2011 - 5:26pm. Oh no no no, that mental image hurt me deep, deep in my soul. I swear, it felt like I was just stabbed. Submitted by RichardB on March 21, 2011 - 7:16am. Don't just throw dictionaries at the zombies: light them on fire first! Submitted by paralian on March 21, 2011 - 7:43am. Maybe you could anonymously shove them through the library's return slot. That would be the lazy man's way of doing it. Submitted by liet on March 21, 2011 - 8:07pm. Submitted by ohcanada_00 on March 21, 2011 - 9:33am. Epic win on the comic. I will now save the three dictionaries within my reach right now for the zombie apocolypse. Submitted by Junodog on March 21, 2011 - 11:54am. Submitted by Cloning_Wars on March 21, 2011 - 2:22pm. Why do you think so many people have Bibles or other religious scripts in their house, even though they never read them? Submitted by Rashkavar on March 21, 2011 - 3:45pm. Submitted by BobIsAPerson on March 21, 2011 - 4:16pm. Using my old college's "high speed" internet taught me the value of having things like dictionaries and thesauruses (thesauri?) in hard copy. And who knows? Maybe if aliens show up with odd conceptions of how to tell who is in charge they'll ask you how to spell commonly misspelled words as a test and allow you one reference. ...worth writing a short story about...? Submitted by Rashkavar on March 22, 2011 - 12:09am. Unlikely -the lack of a common language makes such a test improbable. A math test is more likely. Meaning I'm screwed. Submitted by Jam on March 23, 2011 - 11:09am. Yeah I can't see how aliens would care about spelling... especially spelling in a language as illogical as English! Submitted by Mortosdersoulstealer on March 24, 2011 - 11:18am. "I know let's take several of the most complicated languages and merge them into one mess and then somehow watch as it becomes one of the most commonly spoken languages just to make life dificult." Submitted by Pimp Chickens on March 21, 2011 - 10:27pm. My school is starting a Humans VS Zombies event this week. I think I'll try to find an opportunity to yell out a spelling lesson. Submitted by Mortosdersoulstealer on March 23, 2011 - 9:14am. Submitted by Mortosdersoulstealer on March 23, 2011 - 9:16am. 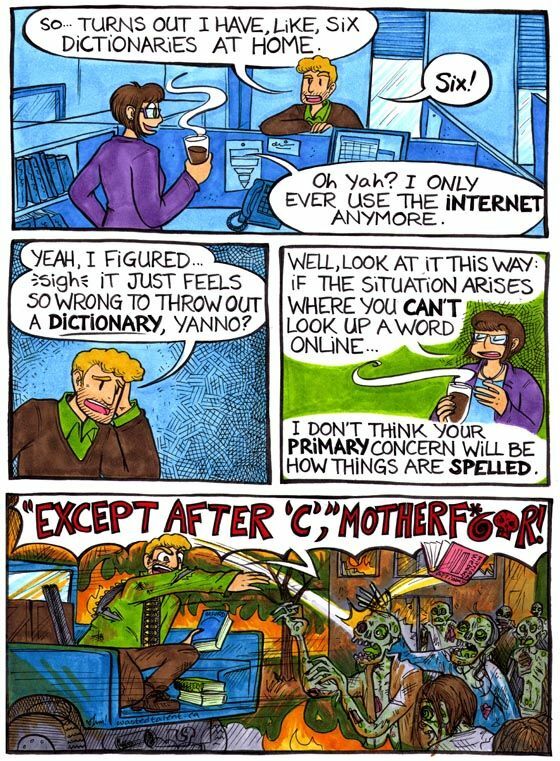 I use the internet to help me spell words I get wrong but nothing can replace a good thesaurus. Submitted by Bruno on March 23, 2011 - 8:50pm. Nice job, I love the absurdities! Submitted by Foilboy on March 30, 2011 - 2:52pm. The PERFECT excuse to keep dictionaries around... now I need to find an equally good excuse for all those take-out menus. Submitted by hazy on April 2, 2011 - 2:49pm. Submitted by TephaAnne on April 8, 2011 - 10:10pm. I think this comic converted two of my friends into fans. Possibly will my sis too when I make her watch it. They have all made plans for the Zombie Apocalypse...no...really. I-.... this is a bit absurd, I apologize.